At Behavioral Diagnostics, we recognize that being a parent is difficult. It’s a concern that almost every parent faces: the prospect of their child becoming a substance abuser. Typically, adolescent substance abuse begins with smoking tobacco, whether it’s used alone or in combination with other drugs. They experiment for a variety of reasons: it could be to fit in, to overcome feelings of sadness or depression, or because they think it will improve test performance. Experimentation, however, doesn’t have to lead to substance dependency. If usage is detected early, the factors that drive the child’s decisions can be identified and modified. Medications aren’t necessary if potential problems are detected early on. Instead, psychoeducational techniques can help parents and children identify evidence-based coping strategies to diminish the likelihood of substance use. Groups like those at the University of Georgia and Iowa State University, are creating culturally sensitive, scientifically proven techniques to increase the resiliency in children when it comes to resisting substance use and the behaviors associated with it. The key to creating substance-abuse resiliency is identifying use in its earliest stages and measuring the child’s response to therapeutic processes. Precisely measures average daily cigarette or alcohol consumption in anyone. Get truthful and accurate consumption results instead of relying on self-reporting. Increase success rate of substance abuse treatments with early and accurate detection. Figure 1. Evidenced based psychoeducational therapies can arrest the development of smoking and its associated behaviors. But the key to the effective use of these interventions is prompt detection. 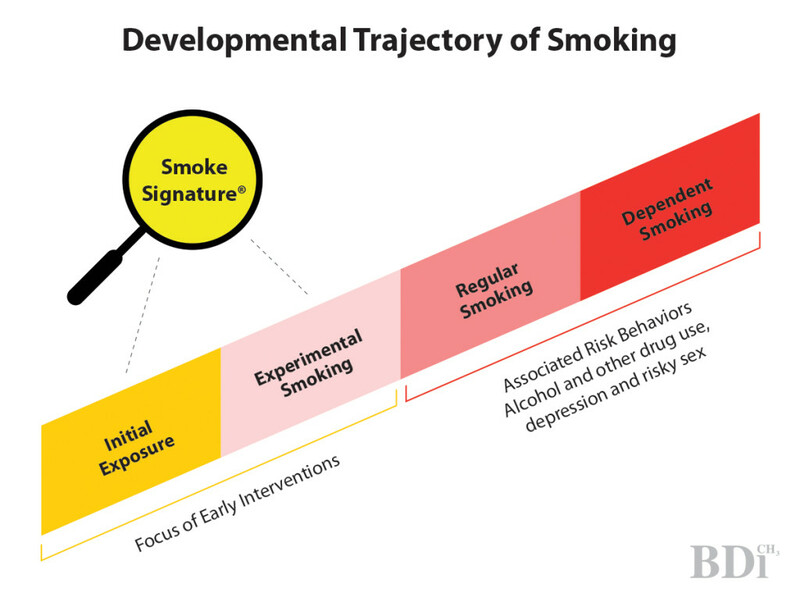 Smoke Signature can detect smoking even at the earliest stages. This allows parents, educators and clinicians to work together to prevent the escalation of risky behaviors. For additional information on prevention programming for adolescents please visit the University of Georgia or Iowa State University websites.